Deadline for Submissions to An Bord Pleanála against Hellfire & Masseys Wood Project. Monday the 24th of September at 5pm is the deadline for making submissions to An Bord Pleanála on the South Dublin County Council & Coillte plans for what is known as the Dublin Mountains Project for the Hellfire Club & Masseys Wood nearby. The plan is one dreamed up by the council and will cost € 19 million of taxpayer money i.e. collected property tax etc for what is basically a bit of a white-elephant project that will damage the environment, limit public access and charge a fee for what is now free and is expected to run at a loss for at least first 3 years, but yet the private contractors running it will be "insulated" from losses. In essence the project will put an valuable amenity that is in public hands effectively into private hands and give them a license to milk the public forever on it. If this gets through, it will be replicated all over the country in that arrogant and greed driven way we are all familiar with from the Celtic Tiger days and again today. The Council as required under Planning law carried out via their consultants an Environmental Impact Assessment Report (EIAR). As expected it is a large document designed to intimidate by it size in the hope that nobody would read it and it is heavy on PR and spin. Instead it is supposed to be the definitive authoritative document on the impact to the environment,. From the start this project was all about privatising a public asset in all but name and creating a mechanism to fleece the public of money to pay for something they currently have for free. The EIAR is in two volumes and attached at the end in PDF form. One should check through the Planning Statement which is attached as a PDF too. It has a few token buzzwords about sustainability and protecting wildlife but this project is nothing of the sort and those words were merely added to give it an air of acceptability and to try fool the public and hide the true motives. However these sentiments are all fine but this project won't be stopped unless you the concerned citizen do something about it and put something in writing and make a submission. With these sort of issues, what matters is not that a few organisations object but that large number of people do too. There are several ways you can do this. You can lodge your own submission, you can group together with friends or neighbours and combine your submission or if you are involved in an organisation that would be affected such as a hiking club, wildlife group, scouting or whatever then you can get them to lodge an appeal. Details on how to go about this are in the box below. In making a submission of appeal you have to be reasonably objective and the points you make are supposed to address the reasons why you think this particular plan is a bad idea and why it should not go ahead. The details of the plan are on the Council website and was sold in a slick presentation to all the councillors earlier this year. Unfortunately for them they were not in a position to look at it objectively but when you do, holes appear all over it. Here are just some of them and they tend to be highlighted in the EIAR, the Planning Statement and through various statements made by the council and their PR representatives. For example on wildlife the EIAR only identifies one red squirrel drey (squirrel nest/den) when in fact those familiar with the area know of many more. The authors spent a very short time physicalyy on site and not enough to understand the wildlife and the habitat and the impact of a massive number of visitors and a large carpark and visitor centre located on the side of the mountain. They surveyed for various animals at the wrong time of the year when it was known they would not be about. The EIAR found far fewer bird species than known to be present. This is like counting cars in a supermarket carpark when it is closed. There are several Natura 2000 Annex 1 and possibly Annex 4 species which must have full protection under the EU Natura 2000 directive and requires public consultation and under the Natura 2000 directive Annex I/4 species protection they cannot be disturbed. In addition if there is a Natura site within close to your development you are supposed to take that into account too. You can see in the Planning Statement how they expect to get away with this when they simply say in sec4.4.5 they imply minimal impact and even claim benefits because they are saying they will increase protections. This is simply not true because their entire wildlife survey and assessment and responsibilities are critically flawed. They indirectly suggest it is this plan or the place would be left to decay as if that was the only plan. There are plenty of plans that could be sustainable but not this one. The council's plan seems primarily focused on the commercial aspect and how to increase the number of visitors for the purposes of ensuring the revenue stream is high enough to support the business plan. This seems to be the only real priority. This is despite stating in their South Dublin County Council Development Plan 2016-2022. Reading it, you would never think this was the same council planning this project. The Dublin Mountains and associated uplands occupy the southern side of the County and extend into the adjoining counties of Dun Laoghaire-Rathdown and Wicklow. The diverse topography and landcover of the Dublin Mountains includes areas of natural beauty and ecological importance (including 3 of the County’s Natura 2000 Sites) and is a key element of the County’s Green Infrastructure network. The mountains also offer significant recreational and amenity value, with popular orienteering courses, climbing areas and walking, running, hiking and mountain bike trails. The Landscape Character Assessment of South Dublin County (2015) highlights the high value and sensitivity of the Mountain Area. The protection of this landscape and its environment is a priority of this Plan. It is the policy of the Council to protect and enhance the visual, recreational, environmental, ecological, geological, archaeological and amenity value of the Dublin Mountains, as a key element of the County’s Green Infrastructure network. HCL9 Objective 1: To restrict development within areas designated with Zoning Objective ‘HA – DM’ (To protect and enhance the outstanding natural character of the Dublin Mountains Area) and to ensure that new development is related to the area’s amenity potential or to its use for agriculture, mountain or hill farming and is designed and sited to minimise environmental and visual impacts. HCL9 Objective 2: To ensure that development above the 350 metre contour in the Dublin Mountains will seek to protect the open natural character of mountain heath, gorselands and mountain bogs. HCL9 Objective 3: To ensure that development within the Dublin Mountains will not prejudice the future expansion and development of a National Park, the County’s Green Infrastructure Network and local and regional networks of walking and cycling routes. HCL9 Objective 4: To ensure that development proposals within the Dublin Mountains maximise the opportunities for enhancement of existing ecological and geological features and archaeological landscapes. There is no proof that it is either sustainable or going to maximise scientific purposes. The EIAR itself was quite unscientific. These are just stated as facts. Section 5.2.2 of the Planning Statement is labelled 'Social Infrastructure and Sustainable Communities' talks about linking the urban areas to the rural -i.e. this site, through a pedestrian route. But why then more than triple parking spaces from 80 to 275. Surely that is encouraging car use? And how does any of this make it a sustainable community? It is not even defined what one is but it is in there as a section title anyhow. 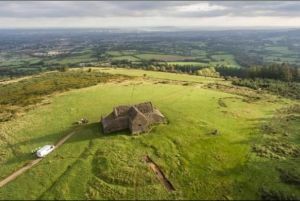 The EIAR was required to look at the archaeological aspect of the site and it has been known for some time it was of high importance because the stones used centuries ago for building the actual Hellfire Club on the top of Montpelier were taken from a burial mound. The report even has to admit that it is an area of huge archaeological significance and identified six National Monuments within Coillte’s Massy’s Wood, and Hell Fire Club land holdings which are protected under the National Monuments Acts 1930-2004 and which are included in the Sites and Monuments Record (SMR). Quoting from the report it says: Recent excavations by the Hell Fire Club Archaeological Research Project suggest that the site is of high archaeological significance. Both this passage tomb and the adjoining one are part of a wider archaeological landscape namely a megalithic cemetery. There are strong similarities to Brú na Boinne which is a World Heritage Site, Tara and Lough Crew in Meath and Carrowmore, Carrowkeel and Knocknarea in Sligo. There are also similarities to the landscape around Stonehenge in the UK, which is also a World Heritage Site. So now with this planning application we have a site of huge archaeological important and the plan is to more than triple the number of visitors and greatly increase intensification of the site. This is reminiscent of the disgraceful saga that befell the Wood Quay site in Dublin during the 1970s and which was probably one of the greatest losses of our heritage for had the right thing been done at the time it would have been of central historic and tourist importance to Dublin now instead of a faceless blob of concrete. Any lighting added for the new path to the top of the hill would be seen at night from all of Dublin and again contravenes this protected status. The EIAR traffic figures for the road are simply wrong and do not make sense and seem inflated to justify the figures for the project. At the moment, it is estimated there are about 70,000+ visitors to site which would corresponds to about 80 cars a day with 3 people each for 6 days each week. The EIAR claimed it counted 112 cars in one hour although they picked the busiest day of the year. Then they suggest the road capacity there can take over 1000 cars per hour, yet it is known on busy days there are huge traffic problems. In other words they are claiming the roads have the capacity to take 300,000 visitors a year. This is not possible and would require a new road thus destroying the very rural and countryside feel of the place which is what attracts people to it in the first place. You can see where they rely on their flawed traffic capacity assessment in sec 4.4.3 of the Planning Statement to say that access and traffic is not an issue. They are using a flawed analysis in one document, the EIAR, as a statement of proof in another. 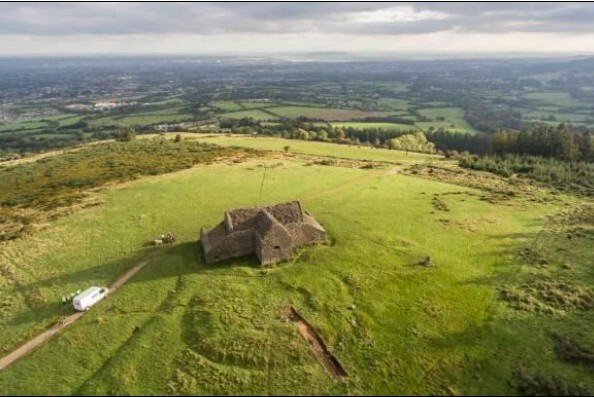 The project proposes to make bring large numbers of tourists to Hellfire Club. These are most likely to be brought in the form of tours on coaches. It is extremely unlikely that any commercial tourist operation will agree to bring people by coach to Tallaght Stadium and transferring them on the proposed "shuttle" bus to Hellfire Club. Instead we are likely to see a large amount of traffic on the roads leading to Hellfire Club. The impact of this has not been accessed and it likely to be detrimental. There is no guarantee that private tour operators will bus their customers to Tallaght first and then transfer them . This is extremely unlikely and unworkable. The current access to the site is 24 x 7 but once construction is complete we are likely to see erection of gates and or barricades that will restrict access outside "business" hours. The impact of this has not been accessed and it likely to be detrimental. In nearby Tibradden Wood access became limited after the commercially run ZipIt centre was opened. The proposed new carpark further up the Montpelier hill represents a gross intensification of use and out of scale and this is contrary to the status of the site where the environment and wildlife is supposed to be protected. It will an eyesore and even though later when the surrounding trees are planted, the sun-glint from cars and buses will be seen for miles thereby obliterating its protected view status. The carpark charge will result in people tending to stay longer than is typical now while the carpark is free. This will lead to a slower turnover of cars in the carpark putting pressure to increase the carpark size to allow more people. If the carpark which is already big does not get bigger, then it may mean there is not the turnover of people to make the proposed commercial operation in the management plan, profitable. The alternative is pressure to increase costs to the public elsewhere and ultimately results in a mechanism to restrict access and thereby charge for that access again. The carpark itself is proposed to be further up the mountain than the present one and will be an eyesore visible from all over Dublin. The proposed footbridge or 'skybridge' over to Masey's Wood will for safety reasons need to be "caged" -i.e. roofed over and will as per management plan be charged a fee. If the public choose instead to walk directly to Massey's wood this will undercut the potential revenue from this and thereby put more commercial pressure on the whole operation to restrict all access to Massey's wood and thereby charge for it. Thus this project will take away public free access from Massey's wood in the longer term. The skybridge is planned to go through the canopy of the deciduous trees in Masseys Wood at the very located where the protected Red Squirrels exist. This would be a gross disturbance of their habitat and they would flee the area. Again this is contrary to the protection of this site. When this was initially "sold" to the councillors on SDCC it was claimed it would make money from day 1. Now the latest business plan shows it making a loss for the first three years. The site selection was inadequate and the criteria for the removal of Orlagh's House is suspect and would have been more in line with protection of the Hellfire and Massey's Wood site by directing any development away from the site which should not been receiving increases in intensification and development considering the protections which apply to it. The planning application proposes to run a sewage mains down the R115 road to link up with the existing watermain and public sewer network. The limiting factor for development in any rural area is the lack of a sewage mains. This will single piece of the plan is possibly the most destructive as it opens up the entire area to lucrative development of luxury homes. As we know from the history of the Planning Tribunals, the verbal and even legal "protections" and "zonings" are no barrier to development and no matter what anyone promises the presence of an installed sewage mains connected to the public network is the key that unlocks the stampede of developers and brown baggers. There is little doubt once one part of the Dublin Mountains was opened up in this way, that the rest of the whole sweep of the mountains would follow. The potential huge money to be made in exclusive luxury homes with views of the city would create enough force to overcome any obstacle. These are just some of the reasons as to why this plan should not go ahead. The two volumes of the EIAR are attached and so is the Planning statement and the "Business" plan. How to make a submission of appeal to An Bord Pleanála against Hellfire & Masseys Wood Project. Anyone can make a submission so long as it reaches the offices in Dublin by 5pm. If you deliver your submission by hand, be sure to get a receipt for it at the reception. It costs €50 which can be paid by cheque, postal order or debit card payable to An Bord Pleanála. This is why making a submission with a group of people is cheaper as it lowers the cost per person. For a submission you must include your name and address. For group submissions, you must also list all the names too. You can only make one submission. You cannot make an individual one and be part of a group one at the same time. Then all you have to do is state why you think the planning application should be refused and give reasons. Unfortunately you only get to challenge the elements of the plan and there is no mechanism to challenge for example the business plan. A submission does not have to be of any particular length. A hand written single page in your own words is sufficient. In most cases the more individual submissions the better as it demonstrates to the inspector the concern of the public. Submissions by organisations would be typically typed and can run to several or many pages challenging the different aspects and deficiencies of the plan. Any submission entitles you to attend an oral hearing and have your say if there is one. Once at the hearing, everything is public and you can ask further questions / queries. If submission is made by a group normally a spokesperson is nominated to attend Oral hearing will arrange a schedule with you for your attendance to accommodate you. Therefore it is a good idea to request that an oral hearing be heard because it is a more democratic and transparent way of conducting affairs and it also allows you to challenge any aspect of the plan at the hearing even if you did not originally do so in your submission. This is useful since you may become aware of new facts not known to you at the time. Not all appeals result in an oral hearing but if enough people ask then there is a good chance. That is why it is good practice to request one in your submission. It is known that oral hearings can continue for weeks but each person's part of the hearing may last for only a few hours. The long time duration of oral hearings can be due to the sheer number of submissions. For those who have time, they can attend as much as the oral hearing as they like. List each of your reasons. We request that An Bord Pleanála holds an oral hearing. There are many reasons, some of which have already been outlined as to why this development should not go through. Other examples can be that you think it will not protect the habitats as required under the EU Habitats Directive or protect the wildlife or it will disrupt and potentially destroy archaeological remains before any further work can be done, it will potentially restrict full public access by charging an access fee, it will destroy the protected views, it will open up the area to commercial development and so on. Save the Hellfire have listed a good summary of valid objections in a pdf at http://www.savethehellfire.com/how-to-help including a template.